Our Truly Stunning Bouquet instantly complements any room with luscious blooms and bold colors. 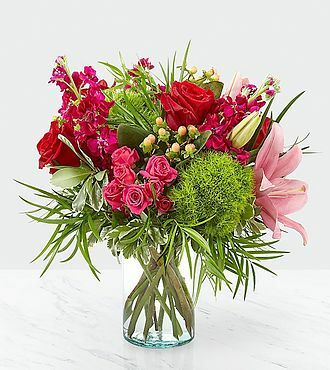 Featuring truly elegant blooms like red roses, pink Asiatic lilies, green trick dianthus and more set in a clear glass cylinder vase, this collection of flowers livens up wherever its placed with beauty. STANDARD bouquet is approx. 14H x 18W. DELUXE bouquet is approx. 15H x 18W. PREMIUM bouquet is approx. 16H x 20W.